Once upon a time, some parents and grandparents would attempt to save tax by putting investments in the names of their young children or grandchildren in lower income tax brackets. To discourage such strategies, Congress created the “kiddie” tax back in 1986. Since then, this tax has gradually become more far-reaching. Now, under the Tax Cuts and Jobs Act (TCJA), the kiddie tax has become more dangerous than ever. Years ago, the kiddie tax applied only to children under age 14 — which still provided families with ample opportunity to enjoy significant tax savings from income shifting. In 2006, the tax was expanded to children under age 18. And since 2008, the kiddie tax has generally applied to children under age 19 and to full-time students under age 24 (unless the students provide more than half of their own support from earned income). What about the kiddie tax rate? Before the TCJA, for children subject to the kiddie tax, any unearned income beyond a certain amount ($2,100 for 2017) was taxed at their parents’ marginal rate (assuming it was higher), rather than their own likely low rate. The TCJA doesn’t further expand who’s subject to the kiddie tax. But it will effectively increase the kiddie tax rate in many cases. For 2018–2025, a child’s unearned income beyond the threshold ($2,100 again for 2018) will be taxed according to the tax brackets used for trusts and estates. For ordinary income (such as interest and short-term capital gains), trusts and estates are taxed at the highest marginal rate of 37% once 2018 taxable income exceeds $12,500. In contrast, for a married couple filing jointly, the highest rate doesn’t kick in until their 2018 taxable income tops $600,000. Similarly, the 15% long-term capital gains rate takes effect at $77,201 for joint filers but at only $2,601 for trusts and estates. And the 20% rate kicks in at $479,001 and $12,701, respectively. In other words, in many cases, children’s unearned income will be taxed at higher rates than their parents’ income. As a result, income shifting to children subject to the kiddie tax will not only not save tax, but it could actually increase a family’s overall tax liability. 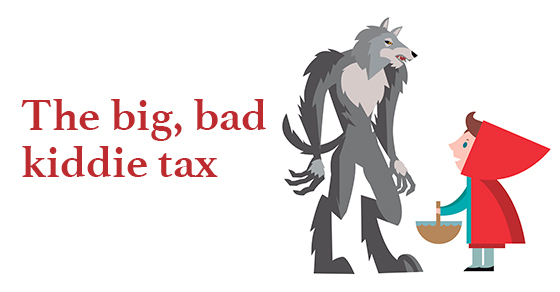 To avoid inadvertently increasing your family’s taxes, be sure to consider the big, bad kiddie tax before transferring income-producing or highly appreciated assets to a child or grandchild who’s a minor or college student. If you’d like to shift income and you have adult children or grandchildren who’re no longer subject to the kiddie tax but in a lower tax bracket, consider transferring such assets to them. Please contact us for more information about the kiddie tax — or other TCJA changes that may affect your family.